The offices of Hackley, Mathers and Jones (Remax House; 31/32 Alfred Place), where the first robbery takes place. John Stewart (Brian Pringle) spots the police and fearing they are looking for him sets off down Bedford Row. 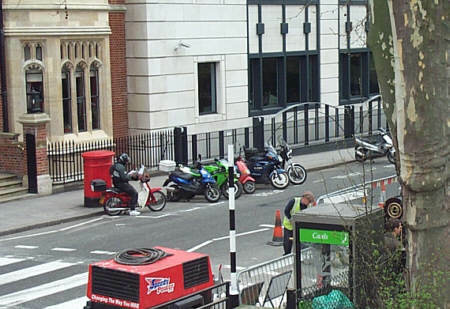 As the hearse carrying Tania's coffin stops at traffic lights, The Invisible Man pulls up alongside on his motorbike. After dealing with its' occupants The Invisible Man drives it away. Mrs. Holt arrives in a Wolsley squad car, and is shown to Inspector Heath's waiting Austin. After leaving the restaurant, she follows Sparrow's Vauxhall round the Square in Brady's Austin Healey. Heath's Austin sets off in pursuit. 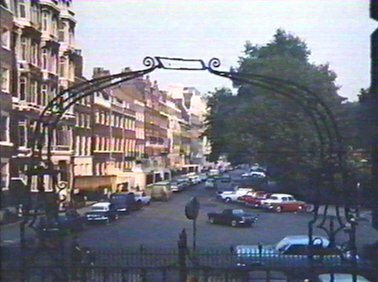 The chauffeur driven Rolls Royce containing Steed moves away from the kerb (Bedford Way) and then takes the first road on the left (Tavistock Square), only to be followed by a potential assassin driving a Sunbeam Alpine convertible. Stewart (Bryan Pringle) steals a car in a quiet side-street. Steed (Patrick Macnee) parks his AC Greyhound sports car and after placing some money in a parking metre, he walks up the street. Meanwhile, having parked his Ford Consul some distance away and on the other side of the road, Fraser (Michael Mellinger) proceeds to follow Steed on foot. Max Fischer (Alfie Bass) takes the bus into town where he intends to plant his bomb (down Eversholt Street and into Euston Road passing Euston Fire Station). 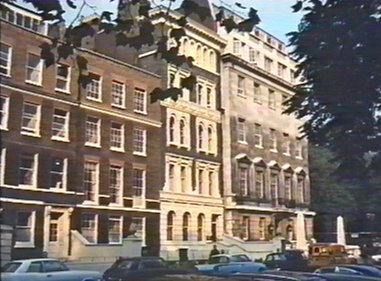 John Drake follows Certhia Cooper to her London office at “The Society For Cultural Relations with South America” (38 and 39 Gordon Square). In order to save Jeff, Marty visits a number of London hospitals including this one (University College Hospital). Jean is driving her Mini to go and see Emile when she is stopped at the traffic lights (Store Street/Keppel Street). Establishing shot of the British Museum. Later, Steed (Patrick Macnee) leaves The British Museum followed by Fraser (Michael Mellinger) walking the short distance to his AC Grayhouse sports car Steed gets in and drives away, followed by Fraser in a Ford Consul. Jeff goes to see Plevitt, an expert on ghosts, at The British Museum. Russell Street on his motorcycle. Evelyn (Anneke Wills) posts a letter in Great Russell Street and then enters the main entrance of The British Museum on her way to see Hamlyn. Annabelle and Stewart take an audio tape recording of the mysterious man, to an expert (at the British Museum) for translation. The Invisible Man guides Tania (Zena Marshall) from the embassy (corner of Newman's Row) and calls a passing taxi which drives her away before embassy staff can stop her. Later, Dee (Lisa Daniely) pulls up in Brady's Austin Healey and goes up to the door. As a flower delivery boy delivers flowers, a hearse and limousine arrive. Watched by Dushkin (Rupert Davies), Tania's coffin is loaded aboard the hearse which leaves followed by the limousine. A disbelieving delivery boy sees the Invisible Man give chase on his bike. During the pursuit, Dushkin's limousine is forced to a halt by a lorry reversing into the square. Jeff is driving over to Jeanie's flat in his Vauxhall when he is intercepted my Marty with new that Jean has already left to see Emile (north up Malet Street, passing the end of Keppel Street). Later Jean takes the same route in her Mini to go and see Emile. Tania's taxi approaches Bedford Square. Jeff arrives (at Metropolis House), in his Vauxhall, for a meeting with the board of the Towler Corporation. 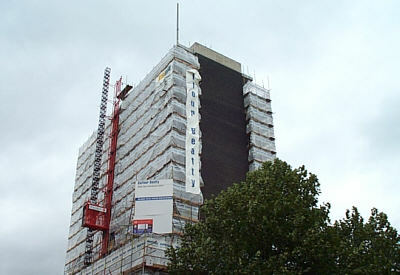 Halliday arrives at tall city centre building (Metropolis House) in a Vauxhall and enters. A Policeman (David Randall) identifies Halliday’s car. Jason and Sir Curtis arrive in a Rolls Royce. A pair of plane clothed policemen are watched by John Stewart (Bryan Pringle). Number 6 walks into World Cameras to collect his transparencies but is being observed. After scanning a street with a spotlight for Eric Jansen, the police Landover is called away by a radio message and drives down this street. Here are two establishing shots seen when Jeff roams the streets of London at night. Here are two establishing shots seen when Marty roam the streets of London at night. Steed enters the Tavistock Hotel, where he has hidden his charge Roland. Later, Steed (Patrick Macnee) leaves the hotel impersonating Roland and gets into a chauffeur driven Rolls Royce. 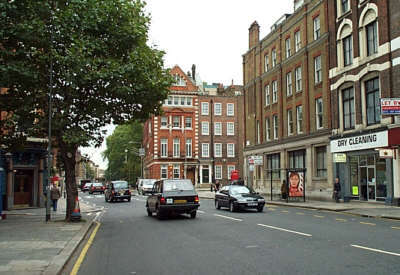 McGill goes to a police station (Holborn Police Station) to identify Max's body. McGill meets Taiko (Yoko Tani) outside but they are observed by Bert (Simon Brent). 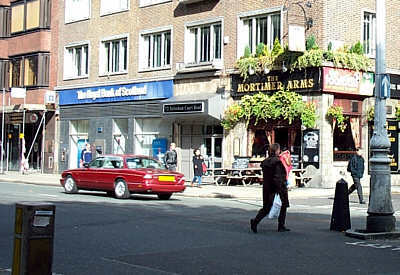 McGill takes Max for a drive around London to discuss why they are being watched (they pass Barclays Bank on the corner of Torrington Place before turning left into Howland Street). Passengers wait for last train to Redbridge in Holborn station. Jason (Peter Wyngarde) and Stewart Sullivan (Joel Fabiani) examine the tube train in Redbridge Station. Hooper , the ticket collector, (Roger Avon) hands over the Redbridge tickets and tells of what he saw the previous night. Clark (Derek Newark) walks through a tunnel of a disused tube station with Gas equipment to intoxicate Jason and Mrs Taylor who are being held in a the secure room. Clark and Rogers (Harvey Hall ) take the drugged Jason and Mrs Taylor (Patricia English) through tunnel here Jason sees a “Stop Hitler Now” poster. Later Draper (Leslie Sands) forces Annabelle (Rosemary Nicols) into the Post Office Underground Station through the ticket office and down to the secure room. Hot on the trail, Stewart Sullivan and Jason King arrive at the station and descend. They find the secure room and force their way in. Marty visits a number of London theatres and clubs looking for Fay Cracken (sequence includes stock footage of the neon sign of the Amdassador's Theatre). Establishing shot of The Talk of the Town. The Lansings are driven to rehearsals of ‘The Exit Room’ at The Warwick Theatre. Rick Lansing takes the opportunity to pay a business call on Harry Blunden. After the regimental dinner Major Donald Ross accepts a lift home from Captain James Murray. After a night at the theatre The Baron is in the flat above his shop with a lady acquaintance. After the premier of 'Sunburst Five', Simon Templer drives Finlay Hugoson (Peter Ashmore) through London to Finlay's appartment in his Volvo (back projection). After meeting Mr. Ching at Heathrow Airport, Cord Thrandel drives him through London to his office (back projection). Simon drops Diana Huntley (Anne Carteret) a lift in his Volvo to The Talk of The Town where she is performing. Establishing shots of the Garrick Theatre at night as Jane Purcell goes in search of her next fix. Later Jane Purcell crashes her car after leaving the club and an ambulance races her to hospital. The doctor on board the ambulance recognises the drug overdose. Establishing shot - London at night. Marty visits a number of London theatres and clubs looking for Fay Cracken (sequence includes stock footage of the neon signs of the Garrick Theatre and The Talk of The Town). It's early in the morning and Jeff has had a successful night at Alan Corder's cambling club (establishing shot of Charring Cross Road near Irving Street). Establishing shot of theatreland at night, including the Talk of the Town. Karen Rule (Hannah Gordon) alights from a bus onto a busy London Street. She dashes into an alleyway (alleyway would have led through to Leicester Square but was lost when the Odeon Leicester Square was enlarged)as she makes her way to Harry’s flat. Pat Stevens (Joanna Dunham) pulls up opposite the Covent Garden Opera House in Brady's Austin Healey. The Invisible Man enters the building and searches for Dr.Stevens. Pursued by The Invisible Man, Stevens runs from the building towards the market. Dr.Stevens (Geoffrey Keen) is seen by a policeman as he passes the market. Pursued by The Invisible Man, Stevens runs through the market leaving a trail of chaos. John Steed (Patrick Macnee) walks through the fruit and vegetable market for a meeting with One-Ten (we see a street sign indicating the junction of Covent Garden and Russell Street). Early morning, and Jeff is still searching for the Rodens. Catherine Fraser (Tessa Wyatt) and Tim (Christian Roberts) hitch a lift on a lorry leaving the market. After leaving his office, Harrold Bilston (David Webb) is confronted by his double. He runs away but is chased by the double and Mullins (Edward Petherbridge). They eventually corner and kill him in a deserted market building. The Contessa is watching the ballet. Early morning Covent Garden, and Jeff is still searching for the Rodens. Cordelia pulls over (by Cleopatra's Needle) to the side of the road after hearing the sound of the fun fair in her radio receiver. Establishing shot of the entrance to a tube station (the station entrance was still part of Charing Cross then). John Steed (Patrick Macnee) walks towards the pub where he will meet One-Ten (The White Lion, 24 James Street). The last train to Redbridge passes through Holborn station. There is an air raid on September 12th 1940 and people hurry to “Camden Road Underground Station” for shelter (stock footage from THE GENTLE GUNMAN). Harry Rule meets Colonel Alexander Krassinkov on the bridge to discuss developments. Establishing shot of the Square at night. Simon Templer is attending the premierr of 'Sunburst Five' based on the novel by Amos Klein (Odeon Cinema, actually the premier of THE BLUE MAX, 1st July 1966). After a night dancing Simon Templar dives Teresa Montesino back to her hotel (past The Empire and The Talk of the Town). The taxi with Harry and Kate Linderman aboard drives through Leicester Square on the way to see another of her father’s associates. Roger Llewellyn (Edward Cast) makes his way through the Underground station on the night of the air raid. When he senses that he is being followed he rushes through the exit, past the ticket collector (Leslie Sarony). After liberating Eve from the department store Albert Baker (Dennis Waterman) carries her through London. He enters a tube station and buys tickets for them both. 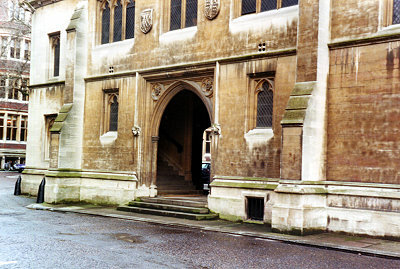 Brett (Roger Moore) and Danny (Tony Curtis) are seen leaving the chapel, doubling as Counsel offices (Lincoln's Inn Chapel), after paying a visit to Jenny Lindley's (Sinead Cusack) lawyer David Conron (Richard Hurndall). 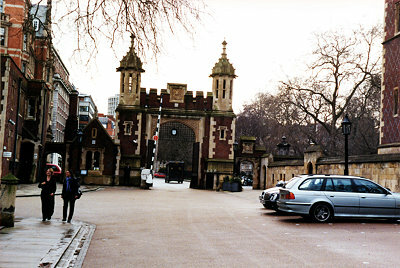 They proceed to Danny's Ferrari and drive off through the gateway (Serle Street), towards Lincoln's Inn Fields. Gene Bradley (Gene Barry) is taken to called to Professor Ballard’s place of work by Sir Richard McKenzie (Richard Vernon), Master of the Cambridge College. At the completion of the case Gene is offered a honorary degree by the master. Brett cross the road from Devereux Court to the Aston parked in a meter zone. He confronts a traffic warden thinking she has given him a ticket. The `ticket' turns out to be a Tower of London postcard. Simon Templar (Ian Ogilvy) Captain Leila Sabin (Prunella Gee) and Stern (Reuben Elvy) try to determine the location that was used for Abdul’s photograph. In a room of an office block (Centerpoint) Sir Eric Coulsdon, chairman of Dalby's company, waits impatiently for Dalby’s arrival. The office block where Saunders of British Intelligence has his office. The taxi with Harry and Kate Linderman aboard drives past Centrepoint on the way to see Regan. John Steed is taken by Wescott through the Inns of Court to the chambers of the Lakin brothers. Shot of the theatre where the play is to take place, to establish the location where Dr Corder goes to speak with the director Paul Stockill (The Playhouse Theatre). Having just bought a copy of the book Basic Calculus, Henry Peabody Jnr. (Stephen Loegering) leaves a bookshop and walks towards Saint Martin’s Lane. He is followed by an un-named woman (Nancy Seabrooke) who also wants the book. Henry Peabody Jnr. (Stephen Loegering) hails a cab to take back to his hotel. The un-named woman (Nancy Seabrooke) who is following him, also hails a cab and this follows. Rawson passes St Martin's in the Field Church and heads into St Martin's Lane as he attempts to lose Drake. Alan Blake (Don Borisenko) and Nina Henderson (Lans Traverse) leave the church as they visit the 'sights' of London. Detective Sergeant Carmichael is sent to observe the Erickson-Randle Construction Company trial at the Royal Courts of Justice. Establishing shot of the city seen prior to Steed making his first visit to Litoff's office suite (view of the Thames looking from Shell Mex House). Colbert moves into his London Hotel (The Savoy). Marty visits a number of London hotels in his search for Dandy including The Savoy (rear entrance, from Savoy Place). Jeannie's travels towards the Public Records Office in her red Mini. The Rolls carrying Sir Curtis and Doctor Stickney Rolls is followed along The Strand and turns into The Savoy. Establishing shot of The Royal Courts of Justice. RETURN OF THE SAINT: The Armageddon Alternative (Leslie Norman: 1978)The Howard Hotel, Temple Place, London, WC2 - Simon Templar (Ian Ogilvy) takes Lynne Jackson (Anouska Hempel) for a meal at his hotel. Tim Hockley (Philip York) is photographed leaving pictures of Jimmy Kilpin’s execution in a telephone box. After the phone call a police car arrives to collect the photographs. Later a police patrol (Brian Miller and Jonty Miller) spot a suspicious car with false number plates parked by the Royal Courts of Justice (this building has since been demolished and replaced). Simon Templar goes to ‘club land’ looking for Cora. Clubs in the area include Safari Club (Grand Buildings). Establishing shot of the Square. Later) The Saint's Volvo drives through the Square. Sir Bruno Luker watches a television news footage of a violent demonstration in Trafalgar Square and comment on it to Octavia. Max Fischer (Alfie Bass) wonders around the square carrying his homemade bomb concealed in a thermos flask. As he crosses the road heading towards Whitehall a policeman stops him and tells him to be careful as he had crossed against the lights. Crowds gather to protest the imprisonment of Ramos Torres. James Lane (Donald Churchill) and his girlfriend Ellen Winters (Anne Lawson) enter the National Gallery. 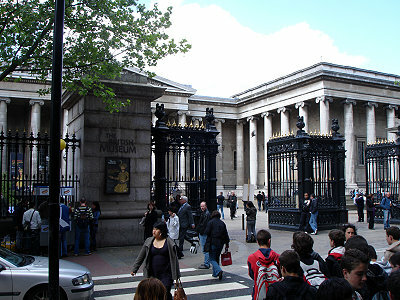 After their visit they leave from the main entrance and wait to cross the road to Saint Martins in the Fields Church. John Stewart (Bryan Pringle) who is out to kill James goes to push him in front of an approaching bus but is noticed by Anne. Stewart quickly leaves and James and Anne cross the road safely. Drake's Mini drives round the square as he heads towards a meeting with General Carteret. Drake's Mini turns off the square towards Whitehall on his way to report to World Travel. Rawson (John Fraser) pays off his cab and walks across the square watched by Drake (Patrick McGoohan) from the National Gallery. Rawson pauses on the corner of St. Martin's Place to check for pursuers. Drake's Mini tuns off the square towards Whitehall. John Drake goes to see Brewster, posing as John Atkins, to apply to join Coote’s mercenaries. Establishing shot of the square. Stock footage of the square. Tim Burton (Jererny Burnharn) catches a taxi. Cordelia returns to London to report to Templeton-Greene after Mannering disappears from the Edinburgh sleeper. Simon Templar drives his Volvo through London before breaking into a house. Later Harry (Jeremy Burnham) follows Penny (Wand Ventham) to Havelock's statue where she has arranged to meet Inspector Teal (Ivor Dean). He watches as they both leave in a taxi. McGill meets with a representative of the Exclusive Photographic Company, Simon Croft, to arrange terms. McGill is in London waiting in his hotel room. Establishing shot of London as Simon Templar takes an unexpected taxi ride. As the trailer carrying Number 6 (Patrick McGoohan) and Number 2 (Leo McKern) passes by Trafalgar Square a motorcycle policeman starts following it. The pigeon Richard Barrett released from his cell is found in Trafalgar Square. Jean Hopkirk arrives at the office to find Jeff worse for ware after a long night on a devorce case (establishing shot of Admiralty Arch and Trafalgar Square). Albert Baker (Dennis Waterman) steals the mannequin, Eve, from the department store and carries her across London. They catch the tube to Trafalgar Square. Establishing shot of “London November 22nd”. 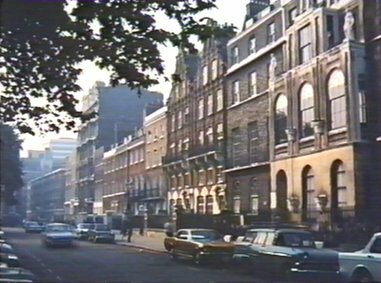 Establishing footage of London before we see the Randall and Hopkirk office. Sir Curtis phones Henry Smith to inform him of Haslet-Wood’s relapse. London, late at night, and to lovers find a quiet corner to park their Mini for a kiss. Operation Rule Britannia is put in place and the treasures of the National Gallery are removed. Very early morning and the square is deserted. Straker and Lake are in London to search Sarah Bosanquet’s apartment. gives us a brief view of the National Gallery and St Martin in the Fields Church as the Rolls Royce, with Sam Milford (Bernard Lee) in the back, passes by. Brett in his Aston drives past Nelson's Column before pulling up outside his apartment. Felix (Joss Ackland) is waiting outside. Whist travelling through London the firing range, Harry quizzes The Contessa about Harry Farr. Mrs Karen Rule (Hannah Gordon) emerges from the London Underground into Trafalgar Square. She is watched as she catches a bus. Harry and The Contessa race to the conference centre after hearing that Professor Schelpin is there (they enter the square from Whitehall and leave by Admiralty Arch). Establishing shots of London where Davies is pleading with Harry Rule to investigate his daughter’s wild ways. Bank robbers pose as tourists on a coach. Simon Templar and Jeffrey Conaught watch film of Christine Hasen (Diane Keen) making contact with a foreign agent. The cab carrying Jean Forrest passes the entrance to the Temple tube station and then she requests the driver to pull up on the other side of the road and he guides the vehicle to a halt beside the Thames. After climbing the wall, Jean Forrest looks out at the river and sees the lights of a boat passing by. Drake (Patrick McGoohan) drives his MG along the embankment, past New Scotland Yard on his way to a meeting at The Palace of Westminster with Lord Gandon. McGill meets Joan Heineman for lunch to discuss her visions. McGill (Richard Bradford) is followed as he leaves the meeting and crosses the road. The trailer carrying Number 6 (Patrick McGoohan) and Number 2 (Leo McKern), driven by the Butler (Angelo Muskat) is pulled over by a motorcycle policeman. All three get out and make their way towards Parliament Square. Harry Rule (Robert Vaughn) stops his car on The Embankment and makes his way down to Westminster Pier. He gets on board the “Silver Mare”, a tourist boat he has hired, to meet an unknown Italian (Milo O’Shea) who gives him a case to carry. Drake goes to see Noelle Laurence after talking to her husband. The Rolls carrying Sir Curtis and Doctor Stickney from Waterloo Station is followed by Major Harwood and Ruckert Who drive across bridge and discusse Halliday.